Facility in reading an ancient language requires several competencies: control of the morphology, a working vocabulary of common words and phrases, and a grasp of syntax. 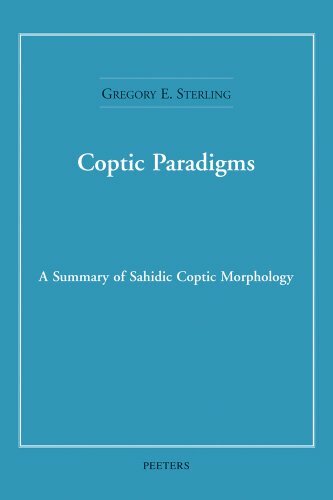 This pedagogical aide addresses the first of these by collecting the basic forms and patterns of Sahidic Coptic and presenting them in a convenient format. It is not a full grammar, but a supplement to a grammar. The work provides beginning students with an overview of the morphology of Sahidic Coptic so that they can see the whole of a part of speech or pattern as they learn discrete parts. It offers those who once learned Coptic but have not been able to maintain it with a concise review. While the work is not exhaustive, it is complete enough that it can serve as a useful reference for those who teach Coptic. The work was developed for a course in Coptic at the University of Notre Dame. It is offered in this venue with the hope that it will help students elsewhere. If you have any questions about this product by Brand: Peeters, contact us by completing and submitting the form below. If you are looking for a specif part number, please include it with your message.